Our KARMA Look Book assists both larger and smaller companies with a wide selection of some of our more popular garment styles, for a variety of shapes and sizes, in both ladies and gents wear. For further options in colours and styles please contact us directly. Using quality fabrics, our corporate wear is designed with both the stylish/modern and classic employee in mind. Our range offers two further fundamentals: comfort and confidence. The KARMA range of formal corporate wear projects a professional and elegant appearance throughout the year. As tailoring and shaping at KARMA Corporate Wear continues to leap forward, our garments are further styled with colour, texture and defining details. A sophisticated and modern approach to uniforms and corporate wear is achieved through our passion for cutting edge design and creativity. Through offering just this, we design company corporate wardrobes to do the talking. Our corporate wear catalogue is continually updated so as to offer our clients a selection of not only previous styles ordered, but new and season- inspired garments to include to your current working wardrobe. We believe that no other garment in a corporate wear wardrobe expresses the success of a business-like appearance than the absolute essential jacket. Business jackets can either seal a corporate look with approval, or blemish the entire corporate clothing effort. 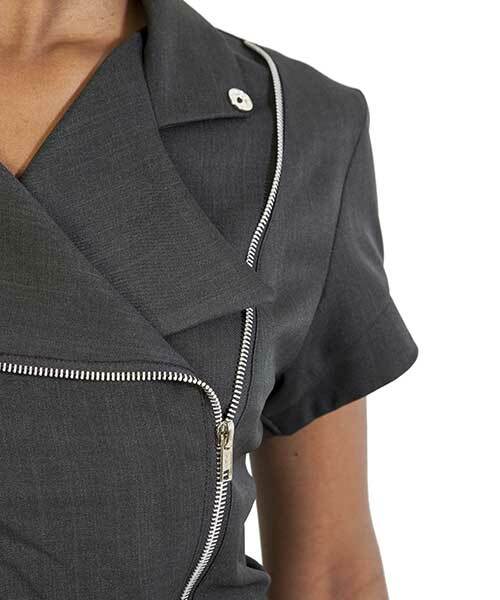 With this in mind the business jackets in the KARMA Corporate Clothing Range have been designed to successfully envelope a diverse business wear interpretation. This essential corporate clothing item not only finishes off a professional, corporate look, but a well fitted corporate jacket will compliment the figure. We believe that a woman should wear a jacket and not the jacket wear a woman. The designs of our corporate business jackets not only allow for preference and comfort, but also suitability and appropriateness. We believe that we are able to offer a suitable tailored-like, corporate clothing look through a large selection of business jackets in our office wear range. In addition, we also appreciate the necessity to offer our corporate clothing range for climate appropriateness. Most of our business jackets are available in either long or short sleeves. At KARMA Corporate Clothing we believe that formal pants have, over time, become a more widely accepted and convenient corporate clothing garment to be worn by women in an office setting. However, not all formal pants are suitable for every woman. Depending on the style of pants, the body type of the woman and their job description, we provide a range of styles to assist women in looking stylish and feeling comfortable. Our corporate clothing design team has created a number of different formal pant styles within the KARMA Corporate Clothing range. These formal pants accommodate varying body types. Some of these are suitable for all body shapes and others are more fitting for specific sizes. We believe that no matter the body type, formal pants should always represent a stylish, elegant and comfortable fit. To further broaden the formal pants options within our corporate clothing range and to accommodate a more casual appearance, many of our corporate styles of business pants are available in Capri length as well. Although we consider business skirts to be essential items in a corporate clothing wardrobe, it is arguably often the most contentious garment within the business environment. At Karma Corporate Clothing we believe this is because the skirt is considered a garment of preference and not necessity. Often many women are reluctant to expose their legs and therefore rather adopt pants as the preferred garment for the office. Our corporate ladies clothing design team recognises this inclination and rather than reduce choice as a result, have in fact increased the business skirts selection in our corporate clothing range. This is to offer ladies an option that would best suit their preference. With this in mind, we have incorporated corporate business skirts that are designed to compliment every body shape and size. With a proper business appropriate skirt selection to best flatter the figure while respecting the business setting, we are confident that every woman will have an opportunity to reintroduce the skirt into her corporate clothing wardrobe. Corporate business shirts should always be practical, comfortable and flattering and as it is worn close to the body, should always represent the figure in the most positive manner. The shirts within the KARMA Corporate Clothing range are structured with these basic principles in mind and not only represent a number of classical lines, but also elegant and modern styles. At KARMA Clothing we approach the design of our business shirts in the same fashion as all the other garments within our range – with the emphasis on choice and figure appropriateness. We believe that the selection of corporate business shirts and one that best fits the body, whether more structured and fitted or alternatively more loose-fitting and flowing, is essential in order to create a successful business wear silhouette. Corporate business shirts are worn with the premise that they are often not covered and are always in the focal point of a corporate clothing outfit. It is therefore essential that design and fit are correct. To offer a wider choice, most of the business shirts in our corporate wear range are available in Cap, Short, ¾ or Long sleeve. Business blouses should always be practical, comfortable and flattering and should represent the figure in the most positive manner. The blouses within the KARMA Corporate Clothing range are structured with these basic principles in mind and not only represent a number of classical lines, but also elegant and modern styles. At KARMA Corporate Clothing we approach the design of our business blouses in the same fashion as all the other garments within our range – with the emphasis on choice and figure appropriateness. We believe that a woman should wear a jacket and not the jacket wear a woman.